Thanks to Steve Whitlatch I got a new ride. He saw it and alerted me right away and I got it! 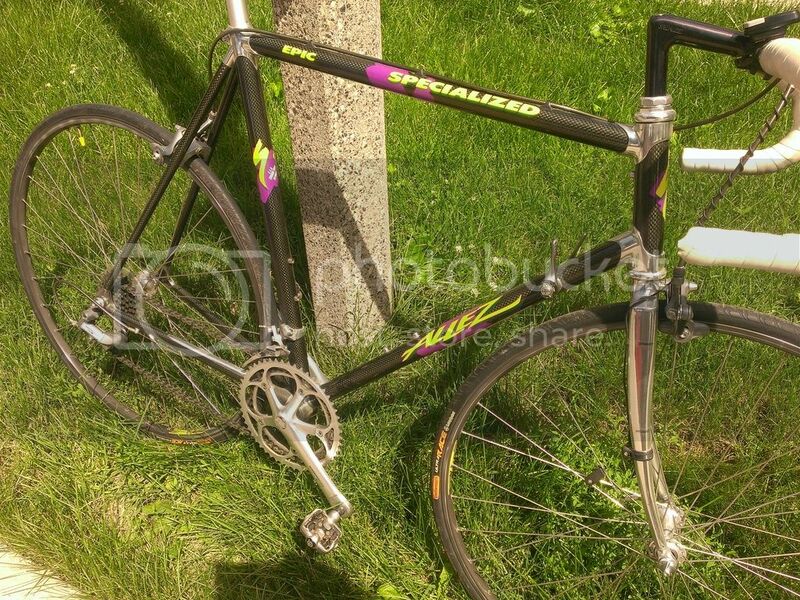 Its a 88 or 89 Specialized Allez Epic carbon. Full Ultegra.. 10 out of 10 shape. NO flaws. Nice ! I'm sure you two will be very happy together. she is just part of the harem. And that list is quite impressive! Looking forward to a ride report. .... Its a 88 or 89 Specialized Allez Epic carbon. Full Ultegra.. 10 out of 10 shape. NO flaws. Nice! Always good to find a special bike. I would assume (I know the risk with this) that you mostly ride the 2011 Specialized Roubaix Elite. Do you ride the others much? I now use an app so I can log the miles I ride on a vintage bikes. But my collected bikes don't get many miles. I only have room to display two bikes.... and an agreement with my wife. some notes on the side..
81 Guerciotti Never ridden. need to mount sew ups. 84 Lotus Supreme Never ridden..NOS dura ace..Ill get around to it. 96 Dynoglide deluxe I take this to the local pool and leave it in the rack..i can wear sandels with it. 11 Specialized Roubaix Elite Daily rider. Another old Peugeot.. which one?